I'll be along to this! Get Cast Of The Capital and Right Hand Left! Unless Sucioperro have changed their sound quite dramatically since I last heard them, I think Kashmir Red are a pretty poor choice for support. I think Kashmir Red are a pretty poor choice for support. Kashmir Red can't make it. Aces, looking forward to this one. Inkster i pm'd you on this one dude. Tickets selling well for this one! I'll be there to review Sucioperro, thus reviewing all local bands too. Anyone who is playing in one of these bands, email me any information/press kits(?) you have on your band if you like. Should be a good one, the new album is pretty impressive. Still tickets available for this one. Snap yours up now! 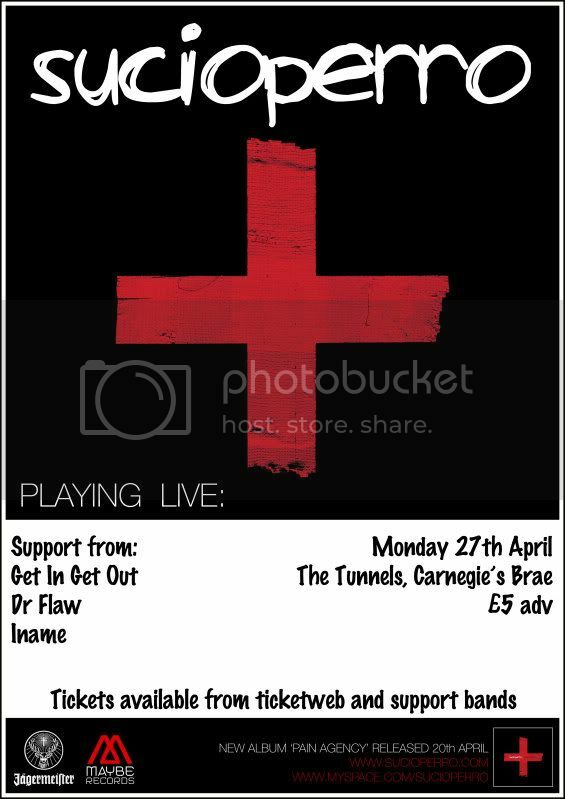 Get yourselves to the Tunnels, 7pm. Should be a good one like!!!!! !